The striking capacity for plants to adapt their growth and development to the ever-changing environment is mediated by diverse plant hormones that regulate virtually every aspect of plant life. In the past 10-15 years, enormous progress has been made in elucidating the nature of plant hormone receptors. An important conceptual advance in hormone biology is the finding that, in addition to the conventional membrane-bound hormone receptors, the main receptors of several plant hormones are localized in the nucleus and directly linked hormone-regulated gene transcription. Despite these progresses, the physiological significance and action mechanism of nuclear hormone receptors (NRs) in the plant kingdom remain enigmatic. Jasmonate is a lipid-derived plant hormone that regulates a wide range of plant immunity and adaptive growth. Sensing of jasmonate by the nuclear-localized F-box protein CORONATINE INSENSITIVE 1 (COI1) triggers genome-wide transcriptional changes that are largely regulated by the master transcription factor MYC2. However, it remains unclear how COI1 relays hormone-specific regulatory signals to the RNA polymerase II (Pol II) general transcriptional machinery and chromatin. A new research led by LI Chuanyou from the Institute of Genetics and Developmental Biology of the Chinese Academy of Sciences showed that Mediator, an evolutionarily conserved multi-subunit coactivator complex whose activity is essential for Pol II-dependent gene transcription, directly bridges COI1 to Pol II and chromatin during jasmonate signaling. They found that, in the resting stage, the Mediator subunit MED25 brings COI1 to MYC2 target promoters through physical interaction. 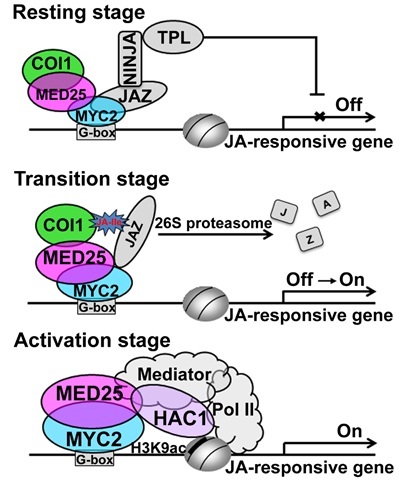 Upon hormone elicitation, MED25 facilitates COI1-dependent degradation of JAZ transcriptional repressors, which favors MYC2-directed transcription of jasmonate-responsive genes. In addition, they found that MED25 also physically and functionally interacts with HISTONE ACETYLTRANSFERASE1 (HAC1), an evolutionarily conserved histone modification enzyme that selectively regulates histone (H) 3 lysine (K) 9 acetylation (H3K9ac) of MYC2 target promoters during jasmonate signaling. Moreover, MED25 cooperates with both COI1 and HAC1 on MYC2 target promoters. These new observations, together with their previous finding that MED25 bridges the master transcription factor MYC2 and Pol II for pre-initiation complex (PIC) assembly during jasmonate-regulated gene transcription (Chen et al., 2012, The Pant Cell), reveal that MED25 acts as a master coordinator to integrate the actions of both genetic and epigenetic regulators into a concerted transcriptional program. The signaling paradigm that Mediator links hormone receptor to transcriptionally active chromatin is likely operates in other plant hormones whose receptors are localized in the nucleus. Moreover, they showed that the overall protein domain composition of the plant MED25 is largely similar to that of its animal counterpart, which engages in a ligand-dependent interaction with retinoic acid receptor (RAR) and several other NRs. In the context that animal Mediator was first biochemically isolated as a thyroid hormone receptor-associated protein (TRAP) complex, and has been shown to be an indispensable NR-interacting coactivator, their study reveals a scenario in which plants and animals have evolved distinct, but nonetheless largely similar, mechanisms for NR activation at the level of transcriptional regulation. Thus, this investigation lays important foundation not only to investigate the action of Mediator in other plant hormones and but also to examine the similarity and difference between plant and animal NR systems. This study entitled "Mediator subunit MED25 links the jasmonate receptor to transcriptionally active chromatin" has been published online in PNAS. This work was supported by grants from the National Basic Research Program of China, the Strategic Priority Research Program of the Chinese Academy of Sciences and the National Natural Science Foundation of China.